Conveniently located in the Heart of Town in downtown Asheville, Haywood Park Hotel is a boutique hotel with 33 guest rooms and suites that exemplify the tradition and glamour of years gone by. The Haywood Park Hotel embraces its history of fine quality and exceptional service as guests are provided with a wide range of amenities and services for an unsurpassed experience. Plenty of attractions are within walking distace where Asheville and North Carolina's history and culture can be unfolded. Simply walking down the Asheville streets full of buskers is rooted in the past and adds to the artistry and culture of the town today. Click here to watch a video about Haywood Park. 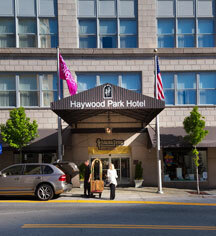 Haywood Park, a member of Historic Hotels of America since 2011, dates back to 1923. The Bon Marché was Asheville’s first department store. The name comes from the renowned Paris retailer of the 1800s, Le Bon Marché, which means “the good deal” or “the good market” in French. Cancellation Policy: Guest room reservations must be canceled three (3) days prior to your arrival date to ensure a full refund of your advance deposit. Deposit: All reservations require an advance deposit to confirm the reservation. Room reservation deposits are equal to the first night’s room charge. Package reservation deposits are equal to one-half the package price. Extra Person Fees: An additional charge of $50 per guest per day will be assessed for each guest over two people staying in the same room. Hotel/Resort Fees & Taxes: No resort fee or additional fees. Pet Policy: Service animals allowed: Yes. Pets allowed: Yes. Dogs only. Fee: $50 per dog (Non-Refundable) Maximum weight: 50lbs. Maximum amount: 2 dogs per room. Other: Please contact the hotel directly to be sure there is a pet friendly suite available over your requested dates. Smoking Policy: Non-smoking property. A fee of $250 per room, per night will be placed on your account as a result of smoking in a guest room. 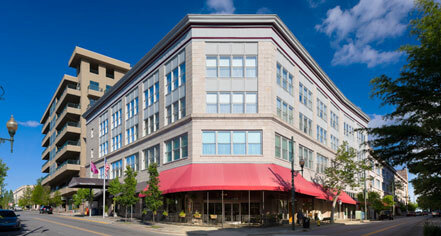 Conveniently located in the Heart of Town in downtown Asheville, Haywood Park Hotel is a boutique hotel with 33 guest rooms and suites that exemplify the tradition and glamour of years gone by. Learn more about the History of Haywood Park .